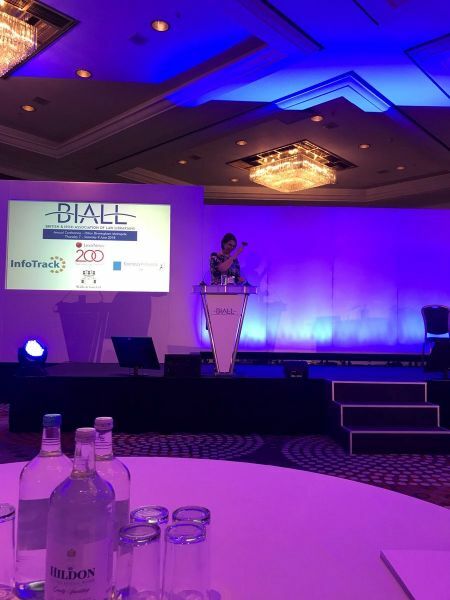 This is the full report on the 2018 BIALL Conference from CLIG's bursary winner, Karen Palmer. Snippets of this have also been used as my contribution to the Bursary Winners report in the July 2018 BIALL Newsletter. Bursary award winners are also asked to assist the BIALL Conference Committee during the conference, and so I got to scurry around with roving mic after two of the Plenary Sessions, I helped with checking members into the AGM, and I also helped collect the envelopes* for the Charity Raffle during the Annual Dinner on the Friday evening. None of these were at all onerous – and made the conference even more enjoyable – so please do think about applying yourself next year! To make sure I arrived in Birmingham in time to attend the pre-BIALL Conference Justis party I had booked myself on the mid-afternoon cheap train from Euston to Birmingham – which turned out to be a four-carriage train. Luckily, I had arrived at the station early and so was able to join one of the queues waiting for the doors to open before it got too long, and then many years’ experience of boarding overcrowded Southern Trains ensured I got the last seat in the carriage! Being able to sit back and relax meant I had time to check Twitter for conference tweets from the comfort of my seat - other BIALL-bound travellers on Twitter seemed to have all booked the inter-city option (faster, but more expensive), and in one case, even gone first class, but the method of travel didn’t matter to me as long as I got to Birmingham. I also took the opportunity to re-read the amazing instructions (which included pictures!) posted by @julie_ferret for getting to #BIALL2018 on foot from thetrain station. Arriving at Birmingham International Station these pictures proved to be very useful, as they not only got me to the hotel, but I also was able to assist a lost delegate from the US as well. By the time I was checking into the hotel, my excitement levels were rising - lots of people in the queue who had been to the pre-conference seminar, but no time to dawdle, as I needed to get ready for the Justis party… I think my top was appropriately ‘garish’. A fair few people I knew to be delegates were at breakfast early-ish – all probably with the same plan as me … get a quick dash around the Exhibition in the 30 minutes before the Formal Opening @ 9.30am! And I was very glad I started my collection of goodies early, as the lovely scarf/shawl I snaffled was soon in use. The first ‘banging’ of the BIALL gavel at conference is when the President officially declares the conference open – this year Anneli Sarkanen’s opening remarks were very personal around her involvement with the Association, and Anneli is a great example of what is the wonderful community of people that make up BIALL. The Keynote Address was given by Dr Gemma John, she spoke about the planning of library spaces, how library services can use the space they have, and the space itself being a service. This was followed by the official opening of the Exhibition (more about this later). For the first Parallel session I had selected to attend 1C ‘Using technology to provide a global library service’, as this is a topic I face every day. Issues covered included balancing the needs of different offices, working across time zones, physical location of staff, language barriers, different public holidays and cultural differences across the firm. Technology in the form of online services brings up the issue of global v limited licences – which to have, and then explain to management that the global is actually cheaper than selected offices … It can also be really difficult when the firm is trying to work globally, but your vendors have multiple account managers and they don't speak amongst themselves. I have come away from this session with lots of thoughts and ideas about what could and should be done with firm intranets, and presenting information from the library to the firm as a whole. The root of the open access to case law problem in the UK is the extempore [oral] judgment (as compared to a Handed Down judgment). An Extempore judgment is the beginning of an extremely convoluted, inconsistent and cumbersome process – we are in the 21st Century and the court systems have not caught up! The tax payer is getting very poor value for money from the MoJ when information is not being made available to the public. There is a good case for this whole process being brought back in house (but I do not think politics will see this ever happening). Four Lightning Talks followed, but the down-side of co-presenting one of them was that I was not able to make any notes on the others – but from the side of the stage they were all brilliant, and I would really recommend this as a way of dipping your toe into speaking at conference. For the final Parallel of the day I stayed with stream C to hear about the experiences of Gowling and Withers moving to agile working. InfoTrack again sponsored the entertainment for the Thursday evening entertainment at conference (Thank you!! ), and this year there was a Beach Party. Lots of Hawaiian/tropical/flowery shirts and shorts, and some very snazzy sunnies were worn. I did not try out the Surfing simulator myself (too klutzy), but lots of people did with varying degrees of success, and it actually got very competitive towards the end of the evening. This was my day to ‘help’ and my first outing with the microphone came with the Q&A at the end of Plenary 3. It was surprisingly enjoyable dashing from person to person. I also had to make sure I was back at the Plenary room early after lunch (again – very scrummy) ready to check members in for the BIALL AGM. Following the AGM, it was a quick dash to 3C, to listen to Claire Fox speak about business planning … lots to think about in the day job. Friday evening was BIALL Awards Evening – this started with the President’s Reception sponsored by Bloomsbury Professional (I LOVED the A-Z of Birmingham music), and we then moved onto the BIALL Annual Dinner. This was once again very generously sponsored by LexisNexis, who were celebrating their 200th anniversary in 2018, and made this evening very special. No awards for me, but the highly coveted Wildy Law Librarian of the Year was awarded to a very deserving recipient - Loyita Worley. Following the Awards and the charity raffle, the dance floor was smoking with the dance moves from delegates until Pumpkin time. Not so many people made it to an early breakfast on the Saturday (I believe there were a few people who saw the sunrise after the BIALL Annual Dinner) … but the turnout for the Panel Discussion showed how keen we all were to listen to them, and then fire questions at them. Another set of Lightning Talks followed – I think @JustisAiden was a little ambitious thinking he could cut an hour talk into a 10 minutes presentation, but I loved watching him try! So, the final session of the conference – Barry Vickery - thought provoking as always, I just need to identify my edge. This was a very lucky conference for me – not only was I awarded the CLIG bursary, I also won a prize in the Exhibition Draw from Wolters Kluwer (thank you! ), and that was on top of the prize I won in the Charity Raffle at the Awards Dinner on Friday night, when I won a Regency Hamper, kindly donated by Justis. Coming to Birmingham for a BIALL Conference had me misty-eyed, the Birmingham Conference in 1994 (Silver Celebrations in the Second City @ the Grand Hotel, Birmingham) was my first ever BIALL experience, and 24 years later I am very grateful to CLIG for awarding me a bursary which enabled me to attend the 49th BIALL Conference. Report from the Emerald Isle - BIALL 2016. Rebecca Loughead of Reed Smith was the CLIG bursary winner for 2016 and writes about her experiences at the BIALL Conference held in Dublin 9th - 11th June 2016. Report from the seaside – BIALL 2015. Julee Carroll of Stephenson Harwood LLP was the CLIG bursary winner for 2015 and writes about her experience at the BIALL Conference held in Brighton 11th - 13th June 2015. Kristel Petrou of Cleary Gottlieb Steen & Hamilton LLP was the CLIG bursary winner for 2014 and writes about her experience at the BIALL Conference held in Harrogate, 12th - 15th June 2014. David Watson of Watson, Farley & Williams, writes about his experiences of the BIALL Conference 2013, held in Glasgow. David was the recipient of the CLIG bursary which helps with costs toward attending the conference. Sam Wiggins of Norton Rose, writes about his experiences of the BIALL Conference 2012, held in Belfast. Sam was the recipient of the CLIG bursary which helps with costs toward attending the conference. Dimitri Zissimos, Research Librarian at Berwin Leighton Paisner LLP, attended the BIALL Conference in June 2011, held at Gateshead. Dimitri was the recipient of the CLIG bursary which helps with costs toward attending the conference. Here's what Dimitri had to say about the conference and the presentations he attended. Tina Reynolds, of Drivas Jonas Deloitte, writes about her experiences of the British and Irish Association of Law Librarians (BIALL) Conference 2010, whcih this year was held in Brighton. Tina was the recipient of a CLIG bursary which helped cover the costs of attendance. Laura Payne, of Baker & MacKenzie LLP, writes about her experiences of the British and Irish Association of Law Librarians Conference 2009, held in Manchester. Laura was the recipient of a CLIG bursary which helped her cover the costs of attendance. Sylvia James, consultant and business information expert gave a talk which clarified many of the more mysterious aspects of the credit crunch and gave us an insight into where the banking system is, where it is headed and what we as information professionals could confidently do to assist our firms in the current crisis. This is a write up of a CLIG event held at Macfarlanes on 27 January 2009. Interesting insights into the work of this Section, with amusing anecdotes such as problems in getting Her Majesty the Queen to sign in the correct place and upside-down flags. These are the slides from a PowerPoint presentation given in March 2009.